Hi, and thanks for taking the time to look at my campaign! My name is Deepu Pampoorickal Thomas. 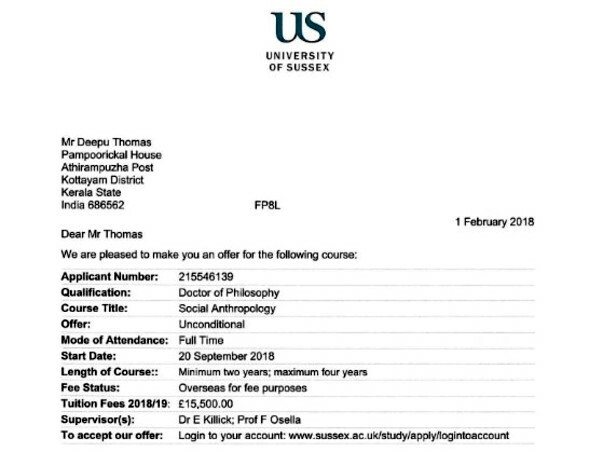 I am trying to raise enough money to pay for the PhD tuition fees. I am hoping to enroll in the September 2018 and I would have to raise these funds by that time. The total amount is approximately USD 22000. 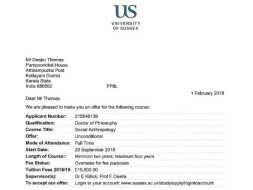 I have included photographs of my offer letters. It has been an incredibly long road. I have considered giving up. But a PhD is so important to me and I have put so much of myself into this already-- giving up now would be foolish. This is a last attempt to have my dream realized, to go to university that I love. Your contribution would help me finally become financially independent and allow me to fulfill my dream. I pledge that I will give back an equal amount of money raised through this forum to others in need when I have reached financial stability (over a 10 year period). Thank you so much for taking the time to read my story, I hope that you find it worthy of a cause to donate. It would mean more than you will ever understand.